I am seated upon a bamboo mat on the ground, notebook in hand and appetite in tow. We have just returned to our lovely host home after an early-morning market excursion to purchase the necessities for our cooking lesson. Bundles of fresh tuna, ever-so-hideous jackfruit and ruby red tomatoes are just a few of the recognizable purchases. Lucky for us, the majority of ingredients we will be using can be found fresh in the garden where we are staying, only footsteps away from my comfy cross-legged seat. I wait quasi-patiently while the slab of wood (for cutting) is cleaned and the knives freshly sharpened. I try to ignore the swarm of ants that are also attending our outdoor cooking class, keeping in mind that the food is always washed a final time before ending up on the stove. 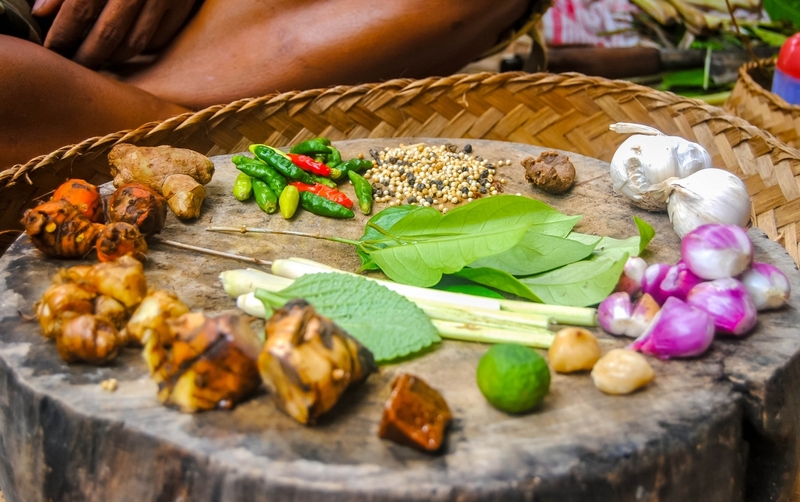 I remind myself how lucky I am to be in the middle of rice terraces and jungle, attending a private cooking lesson from a local Balinese family. Finally, after a couple of stomach grumbles have already begun, it’s time to get cooking. The lovely couple, Made and Rinin, are our top chefs for the afternoon, and I couldn’t have asked for a warmer, happier pair to instruct me in the ways of Balinese food. Our menu for the day will include lots of soups — chicken soup, jackfruit soup, and cucumber soup. 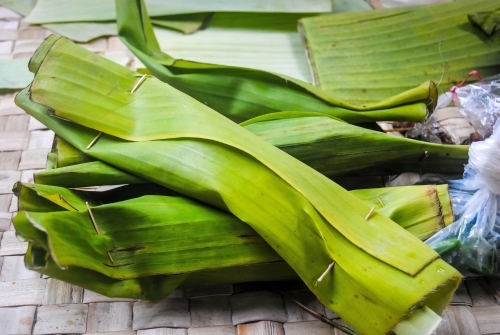 Fried tuna, tempeh (soybean cake) and sardines steamed in banana leaves will also make an appearance for the main meal. Desert will be sticky rice, dowsed in brown sugar and generously sprinkled with grated coconut. But before we can begin any of the cooking, we have to prepare the one essential ingredient, Bali’s special spice: base gede. This colorful and aromatic spice is the base for all of Made and Rinin’s recipes. A beautiful assortment of ginger, garlic, shallots, coriander, red and green chilies, lemongrass, brown sugar and galangal are assembled upon our cutting board. Made pauses before adding the final ingredient, turmeric, to make certain he can explain its value as an antiseptic and energizer. He also ensures turmeric will save me from any stray bugs that make their way into our open-air kitchen. Although I try, I don’t think my smile in mock agreement to this last statement is very convincing. The ingredients for the spice are now ready to be finely chopped. And then chopped again. And again. Finally, my cutting job is approved and we can move the mosaic of spices to a mortar and pestle. I’m allowed to grind at it for a while, until it becomes apparent we will never be allowed to eat if I don’t hand the tool over to my instructors. In mere seconds Made has created a fine paste, and the central spice is finished and allocated to the different dishes we’ll be preparing. We chop the head off a chicken (thankfully already dead) and drop it into a pot of boiling water with lemongrass and the base gede. Somehow, the massive jackfruit is chopped open and the edible, raw fruits removed so they can follow a similar route. Finally, bites of cucumber and tomatoes, with a handful of coconut, are boiled to create our cucumber soup. While the soups are simmering, the tuna and tempeh are fried in homemade coconut oil until golden brown. We cover every possible millimeter of the sardines with our special spice before rolling them in banana leaves and sealing them with wooden skewers. I’m not particularly good at getting the skewer in without severing the entire banana leaf, but my kind instructors just laugh it off. The sardines are sent to steam in bamboo baskets adjacent to the rice over a traditional fire out back. I can’t believe that our hosts prefer to use a wood fire to the stove, but Rinin insists that she can tell a difference even if it does take much longer to prepare. Unfortunately I don’t think the caliber of my taste buds is quite up to her standard. And then finally, after the aromas have teased us for what seems like ages, the boiling and steaming and frying are finished. We can eat. Often Balinese will go off on their own during meals so they can thoroughly enjoy the textures and flavors, but our personal chefs have insisted on joining my friends and I for our meal. We sit upon comfy cushions, still on the floor, having relocated to an outdoor dining area. Thankfully, the labor is well worth the reward. Rice is employed to soak up our numerous soups before we shovel the deliciousness into our mouths. Made contends that Balinese food tastes better when eaten with your hands, and I think I might actually agree as I forego the use of utensils. Despite the fact that the base gede went into everything we cooked, all the dishes taste unique, balancing spicy, salty and nutty flavors. I can’t get enough of the simple tempeh, although the sardines are a close second. And just when I am about to burst, I remember the sticky rice is still coming my way, a special addition to our meal from Rinin’s heart. It’s incredible, and the subtle sweetness is a welcome endnote to the spiciness of the meal. I haven’t yet tried to recreate any of the dishes I learned to cook from the class. I’m not sure I’m even going to try, to be honest. What Made and Rinin offered me that day was enough for a lifetime. 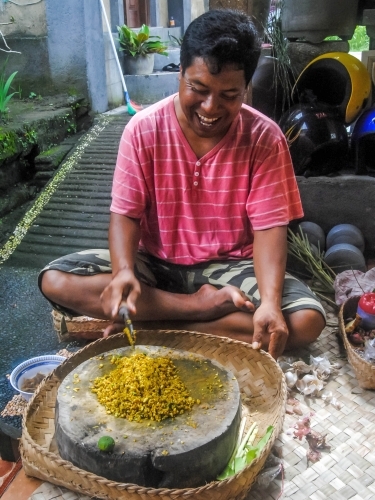 Through the noises and bartering at the morning market; the colorful array of exotic spices arranged on our wooden slab; the way they made me feel like family, joking at my slow cooking skills compared to their efficient and knowledgeable hands, Made and Rinin gave me a brief glimpse into true Balinese culture. They brought me straight into the day-to-day lives of traditional Ubudians, and for this, I will be forever grateful. 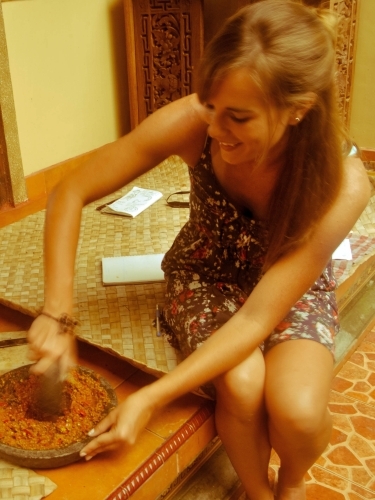 If you’re interested in scheduling your own private cooking class while in Ubud, click here to contact Made and Rinin at the Dukah Village. Casey Siemasko is an avid traveler, finding her inspiration when exploring new places and meeting new people. When she’s not teaching English or blogging, she enjoys practicing yoga, training for marathons and scuba diving. Oh, and wine. She and her husband comprise the two lovebirds documenting their travel musings at ACruisingCouple.com. Currently residing in Taiwan, they are gearing up for life on the road, starting in Southeast Asia this fall.